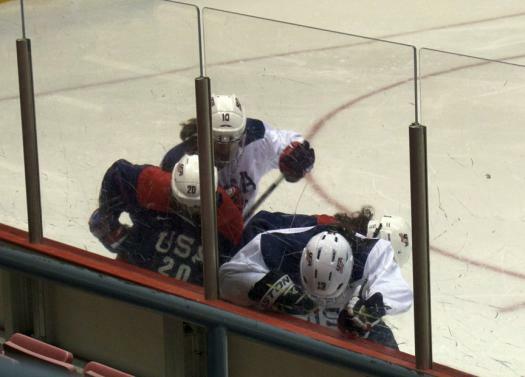 Walking into the Herb Brooks Arena for Thursday’s intra-squad scrimmage, the colorblind or the uninitiated would have thought they were watching a battle between the U.S. Women’s National Team and their rivals to the north. Bodies were banging and players flew up and down the ice as the nerves of Wednesday’s first scrimmage gave way to a more determined focus as each of the 41 hopefuls was eager to leave an impression with the coaches watching from the stands. Less than a year removed from her second concussion in nine months, Josephine Pucci showed no signs of the rust that came with a lengthy layoff, and even fewer indications that she is willing to alter her aggressive style of play. 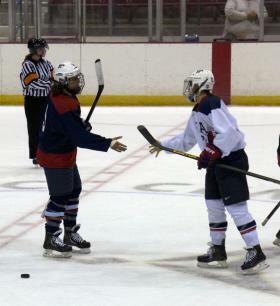 The Pearl River, N.Y., native was a physical presence on the ice, throwing her weight around, all 149 pounds of it, in an attempt to put her opponents off their game. “Coach [Katey Stone] came into the locker room before the game today and gave a little bit of a wake up call. She said ‘this is your shot. You have three games left’ [to prove yourself]. I think that that sort of helped us pick up the pace a little bit and everyone was fired up,” Pucci said after Team White’s 4-1 win. Pucci’s play caught both the eye of the on-ice officials, who whistled her for several penalties, and Stone, who was watching from the stands. “There was one point that I turned to the coaches and said, ‘if there’s one thing I know it’s that I’m glad I’m not out there right now.’ It was very spirited,” Stone said afterward. For Pucci, this camp is about more than just earning a spot on the U.S. Women’s National Team. It’s about returning to the ice and her normal way of life after suffering her second concussion in nine months. She suffered it last August in an Under-22 game against Canada in Calgary. She returned for her senior year at Harvard University but soon found that even the simplest of tasks, such as writing a paper or reading a textbook, would produce an intense headache. That’s when she left school and returned home and devoted her time to getting well. “Concussions are scary and you have to take care of it, whether hockey is in your future or not. It’s something that affects your whole life. You got to be patient with it. The ups and downs are going to happen. In the end, getting your health back is the most important thing,” said Pucci, who is majoring in Psychology. She is hoping that her time will come here in Lake Placid when USA Hockey announces the 25-player roster that will begin the long road to Sochi, Russia and the 2014 Olympic Winter Games. 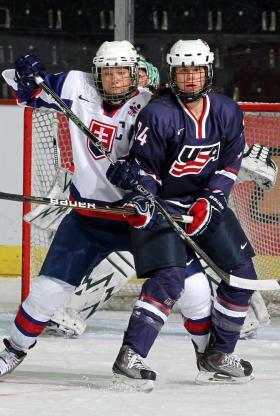 After playing on the U.S. Women’s National Team that lost a heartbreaking overtime loss to Canada at the 2012 IIHF Women’s World Championship in Burlington, Vt., Pucci could only cheer from afar as her teammates earned a measure of revenge by winning gold at this year’s event in Ottawa, Ontario. Pucci said she is fortunate to live and train in Boston, where some of the top neuroscientists are working diligently to understand and deal with the effects of concussions. With two more scrimmages and a handful of practices left before Monday’s announcement, Pucci thinks the intensity will reach an even higher level. But while they battle hard on the ice, it is all for a common goal, and the competition will only go up when the puck drops in Sochi. “Everyone here is good friends or at least knows each other pretty well, but once you step on the ice it’s all out,” she said.